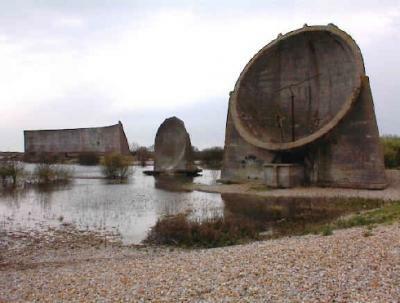 Sound Mirrors or reflectors were first built in the 1920's as an early warning system that listened for the sound of airplane engines. A concrete bowl shaped reflector focused the sound waves onto a microphone at the focus of the bowl in much the same way that a satellite dish works with radio waves. Many different sizes and types were tried in an attempt to get that vital early warning of attack by enemy planes, but the system was rendered obsolete by the advent of Radar. Submitted by Jerome Joy on Sun, 2007-10-14 10:56.